I’ll be honest: I’m not the biggest fan of Early Access. 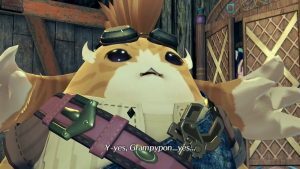 You’re essentially paying money to “purchase” and test a game without any guarantee of what the final product will be or how the game will change over the course of its development. It’s potentially an “all risk, no reward” scenario for anyone who isn’t the studio producing the title in question. But, like it or not, Early Access is as much a part of our lives now as wireless controllers and debates about resolution and framerate, and it’s pretty much the way to go if you’re developing a PC-centric title. 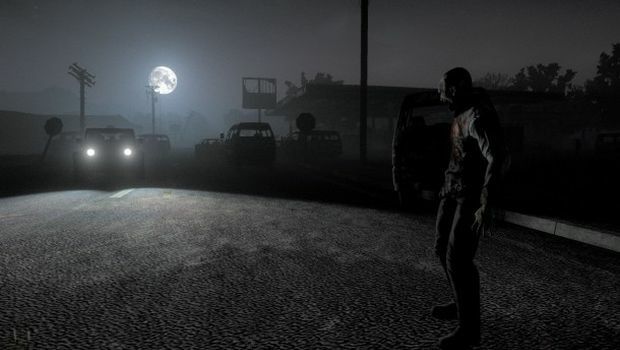 All this talk about Early Access, of course, brings us to H1Z1, an open world zombie survival game. 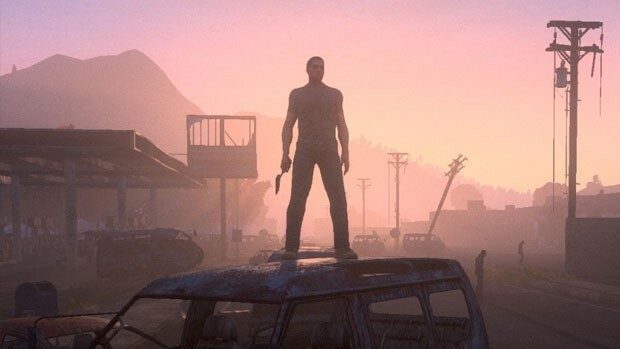 You’ll begin your time in H1Z1 by picking a server and creating a name for your character. After that, you’ll spawn in a random slice of rural North America with little more than the clothes on your back. From there, your goal is simple: survive the apocalypse by scavenging food, water, and equipment while simultaneously avoiding the zombies that litter the ruined landscape and surviving the other human players, many of whom will kill you as soon as look at you (unless you’re on a PVE server; then, they’ll just ignore you). It’s a struggle for survival, and the objective is simple: stay alive however you can, for as long as you can. Got it? Good. Now, you’d better get moving, because you’ve got about half a day (or two hours in-game) before you die from starvation and/or dehydration. "If there is one feature that sets H1Z1 apart from DayZ, it’s the ability to craft items, weapons, and even structures. How you do this isn’t always obvious – one of the best strategies early on is to take off your shirt, rip it into pieces, and combine it with wood to build a bow – but it does add an element of personality to the game." If this sounds – okay, scratch the “if.” H1Z1 is basically a clone of Bohemia Interactive’s DayZ. I’m not usually one for criticism by comparison, but the similarities here are incredibly hard to ignore. You’re going to die. In fact, you’re going to die a lot, especially early, as you learn the game’s systems and form the habits that will get you further and further each time. Like DayZ, the game itself changes drastically every time you die. On my first life, I found a gun (but no ammo), a hammer, and a crowbar, and thought I was doing fairly well, until I realized I couldn’t find any food. I tried beating a deer to death with the crowbar, but… well, you know how it is. The second time around, I found a ton of ammo (but no gun, natch) and food, and even a car. Unfortunately, I couldn’t find any water, and my car ended up flipping over after I picked up another player, who promptly abandoned me, and I died of dehydration, alone, in the middle of a forest. Fun times. If there is one feature that sets H1Z1 apart from DayZ, it’s the ability to craft items, weapons, and even structures. How you do this isn’t always obvious – one of the best strategies early on is to take off your shirt, rip it into pieces, and combine it with wood to build a bow – but it does add an element of personality to the game. Building your own structures, and carving out a home, is a pretty neat feature, even if you do have to use a wiki to figure out what materials build what. That said, it’s definitely not easy, and it requires many materials and often a specialized item or two before you can really take a crack at it. "Your success is very much dependent on where in the world you spawn and what’s around you, and the game is set up so that, more often than not, you will fail. As a result, the promise of easy loot is pretty tempting." The other thing that H1Z1 offers is air drops. 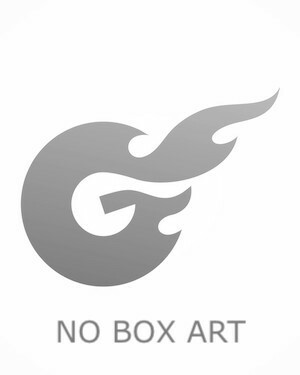 Essentially, air drops allow players to purchase a crate of randomly generated supplies that are dropped into the game, usually near the player’s location. This has caused some backlash in the community, because SOE president John Smedley previously stated that players would not be able to purchase important items in-game. In and of themselves, the air drops are not an issue, but they become one because of how the game is designed. Because resources are so scarce, and many of the items required to obtain certain materials or build specific things are very rare, H1Z1 seems like a game designed to part you with your money. Your success is very much dependent on where in the world you spawn and what’s around you, and the game is set up so that, more often than not, you will fail. As a result, the promise of easy loot is pretty tempting. That said, there’s no point in spending your money on H1Z1 at this point because, unique building mechanics aside, the game just isn’t very good. Playing it is just unsatisfying, and most of what you do just isn’t interesting. Searching for supplies essentially boils down to pressing “E” and watching a timer count down as your character rummages through cupboards or as you watch a physical item (a water bottle, ammo, weapons, etc) magically vanish into your inventory. Combat isn’t much better. 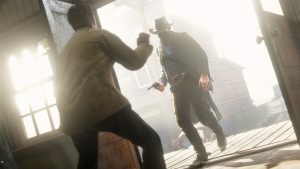 Ranged scuffles have some pop to them, but melee battles feel more like Skyrim – ie, you slap each other around with what feels like a wiffle bat, with little feedback of any kind, until someone falls to the ground and spasms around for a few seconds as they try to avoid clipping through the ground. "H1Z1 doesn’t look particularly good, either. Sure, it can look nice when the sun hits everything at the right angle, usually at sunset, and the scale of the world is legitimately impressive, but beyond that? This game is ugly, man. Some of these textures wouldn’t fly on the N64, let alone modern PCs." Worse yet, the game’s inventory, which measures how much you can carry with a numbered capacity, isn’t intuitive and is clunky to navigate, and the actual survival mechanics are pretty barebones, focusing mostly on stamina, hunger, thirst, and overall health. Sure, there are multivitamins and antibiotics scattered around the game world, but its borderline impossible to get sick, and even harder to end up with a physical injury worse than minor bleeding. From fights with zombies to car crashes, everything I’ve had to deal with has been something I could walk away from with little more than a bandage and a can of beans. H1Z1 doesn’t look particularly good, either. Sure, it can look nice when the sun hits everything at the right angle, usually at sunset, and the scale of the world is legitimately impressive, but beyond that? This game is ugly, man. Some of these textures wouldn’t fly on the N64, let alone modern PCs. Animations are jerky, the forests are lifeless and bland, and the buildings are cookie-cutter with many of the same furnishings. Even the rain looks terrible. Now, you might argue that all of this will change because this is an Early Access game, and there’s some merit to that. But putting the graphical issues aside, this game has no soul. It’s bland old undead America, all over again, and it’s not like that’s in short supply these days. 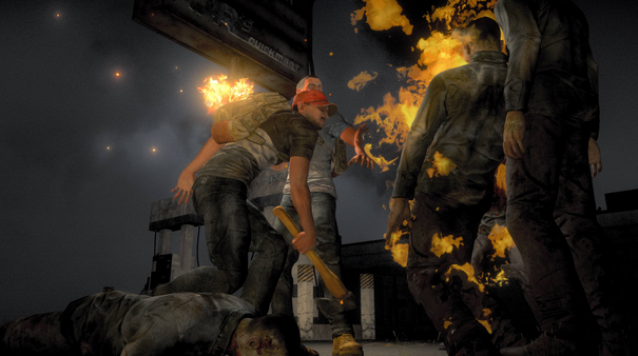 Right now, H1Z1 is the picture of a rough Early Access game in the first throes of life. To succeed in the long term, however, it’s going to need to be more than just another game that’s riding the wave of DayZ’s success. It needs to be unique, and fun, and different, and right now, with very few exceptions, it isn’t any of those things. Right now, it’s just another game asking you to pay for the privilege of beta testing, and on top of that, it has the gall to design its systems around microtransactions so, you know, you can pay more for an uninspired, unfinished game that isn’t very good. And in a world oversaturated with zombies, that just isn’t enough.